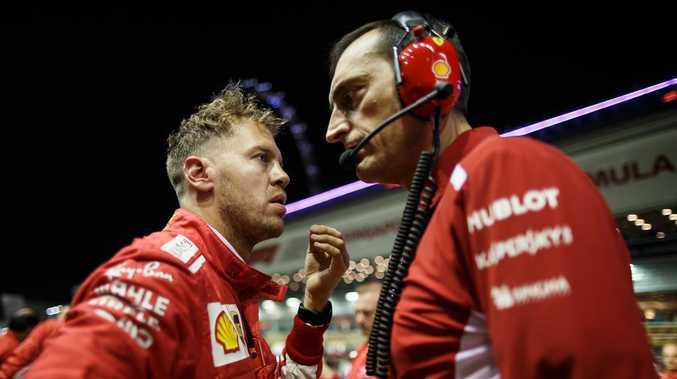 A FRUSTRATED Sebastian Vettel felt Ferrari's strategy did not give him a chance of challenging Lewis Hamilton at the Singapore GP and rued that "we beat ourselves". The German overtook Max Verstappen for second place on the first lap but was unhappy with his team's tactics after they pitted him early, a move which saw him lose time behind a Force India and subsequently lose a position back to the Red Bull. 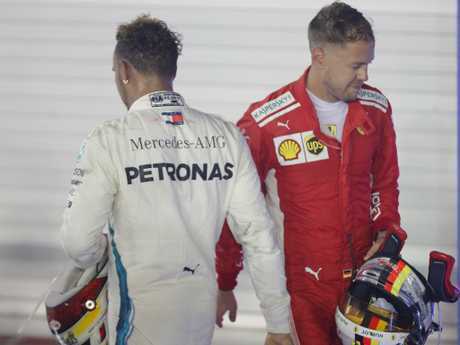 "We tried to be aggressive in the beginning and obviously it didn't work out," said Vettel, who finished third behind Hamilton and Verstappen. "With the way we raced today we didn't have a chance. "I said before the weekend we could only beat ourselves and I think today we didn't get everything out of our package." Vettel's annoyance was compounded by the fact he is now 40 points behind race-winner Hamilton, after a Grand Prix that Ferrari were expected to dominate, and Mercedes were expected to struggle at. "It was pretty obvious what we tried to do and it didn't work," he added. "It was clear we were not fast enough in the race, we need to understand why. It's largely due to how we decided to race and which tyres for how many laps. What we tried to do was get to first position and get ahead, but Lewis was too quick. "Once you are ahead you can control the pace around here, but we never got ahead." The result prompted F1 legend Eddie Jordan to declare the 2018 drivers championship race decided. "It's over," Jordan told Channel 4. "Today was a big dagger in the heart of Ferrari, it was shocking. They didn't get it right, their strategy was shocking. They have condemned themselves to losing this championship today." "This was their race," Sky F1's Anthony Davidson added. "This is Vettel's track and this is Ferrari's track. And they didn't capitalise." Ferrari team boss Maurizio Arrivabene explained the strategy while declaring Hamilton deserved the victory. "After Sebastian overtook Verstappen, we went for an aggressive strategy, trying for the undercut on the Ultrasoft tyres," he said. "Unfortunately, during the one lap that would prove to be crucial, we found ourselves behind another car and so we were unable to run at a fast enough pace. "Despite today's result, not all is lost. Now, calmly and with determination, we will tackle the remaining six races, fighting all the way to the end." It's not the first time Vettel has questioned his team's strategy in recent weeks - he was similarly dismayed after the qualifying sessions in Italy and this Saturday's. But the four-time world champion did insist in the post-race press conference he "will always defend the team". "The decisions we took in the race were to try and be aggressive. If it works then it's great; today it didn't work." Vettel explained. "It obviously didn't work by quite a bit, so we have to look into that. But we saw something and that's why we go for it. "If it doesn't work it's always easy to criticise, but I will always defend what we did. But overall we had a very strong package, both Kimi and myself looked very competitive throughout practice, but in the end if you look at the race result we finished third and fifth. Like yesterday, probably not where the speed of our car belongs. "So that's what I meant by saying we didn't get everything out of ourselves." Vettel admits Ferrari can learn lessons from their rivals after being beaten by both Mercedes and Red Bull. "There are a couple of differences that are standing out about yesterday and today, things we can learn from the others," he added. "If they finished ahead of us by half a minute, they clearly did some things better than us."